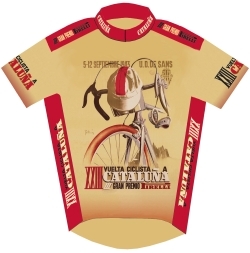 The 3rd design for the RIA Co. Horton Collection Line is inspired by the official poster from the 1943, 23rd Vuelta Ciclista a Cataluna. The race was sponsored by Pirelli. The Retro Image Apparel Company entered into an alluring co-branding agreement with Brett Horton in April, 2006. The Horton Collection boasts being the largest collection of vintage cycling posters in the world.